Dave and I have been married for FOUR years as of March 23rd. I can hardly believe it. Since our first anniversary I've always held up however many fingers old we are in marital years and told Dave, "We're one! ", "We're two!" and so on, and this year, we are four! At first Dave thought I was so weird for doing this but now I think he secretly likes it. 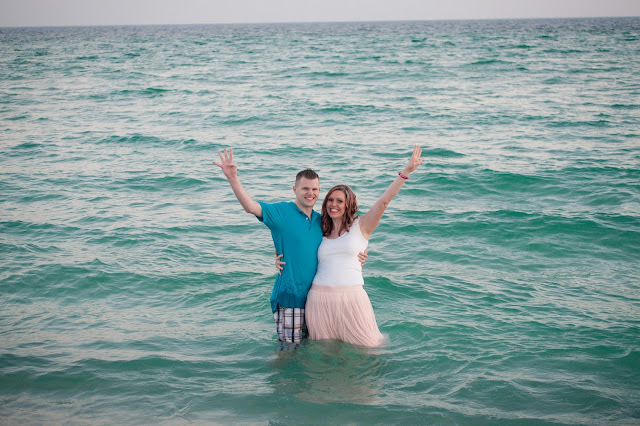 Also, these pictures were taken at Pensacola Beach in March by the same photographer, Naomi McIntosh, who did our wedding and trash the dress photos. I have another post coming with more of these pictures but today I wanted to share some of the things I have learned in these last four years of marriage. I wondered if four years was too young to write out 'advice' like I'm full of wisdom compared to those who have been married 20, 30, 40 years but these are still good lessons God has allowed me to learn so I thought I'd share. 1. Before you get married meet with some godly women, who have godly marriages, to seek their advice on marriage. Dave and I dated long distance for a year and while away I met with some of the godly women in Korea. The advice I received was custom fit for my marriage because I still think of it and refer to it often. I even have a Word document called 'life as a wife' with their advice in it. I'm so thankful I asked those women and am thankful they were willing to invest in my life. -Log out of social media for a year. Gasp! Yes, it can be done. -Decide you won't discuss marriage problems with all your friends but will first go to God and then your husband. -Make time with your husband a priority and guard that time! Any other ideas on that one? 3. Get a mentor. Life changes are so incredibly difficult for me. I always think I'll do okay and then the struggle is real! When Dave and I moved back from Asia to America, as wonderful as it was, transition was hard and our marriage had some hard days. I told Dave I wanted a Christian mentor and he thought that was a good idea too. I asked a lady at my church who leads our Bible study and she said she would be glad to do so. (side note: I have no idea how old my mentor is, probably 20-30 years older than me, but I know she is further down the road than I am. I think a mentor should be someone who has more experience in life than you do.) I meet with her probably once a quarter and tell her all about my marriage and life. She encourages where I need encouraged and corrects me where I need correcting and I'm so thankful for that. It's been a huge blessing. Lastly, in my opinion, a godly mentor should not be family. Your Mom will most likely pick your side on issues and you should have someone more neutral. 4. Laugh about lots of things. I think Dave and I have improved on this a lot in the past year. Which, now that I think about it my mentor encouraged me to do this more, Dave is already good at it. Laughter can often diffuse a situation. Instead of taking everything so seriously laughing and kindly joking is sometimes healthy. Dave and I have serious discussions too but laughter can do your marriage and heart good. 5. Psalms 127:1 is a great verse to pray over your marriage. It says, "Except the Lord build the house, they labor in vain that build it." You can do all the work you want for your marriage, and you should, but if you don't ask God to build your marriage than the work you do is in vain. 6. Marriage is a tool God uses to show you the best qualities in you and the ugliest ones and I'm thankful for both. It's not fun to realize that we struggle with certain things but I'm thankful marriage brings those to the surface so The Lord can refine and mold my heart into who and what He wants it to be. Those are some of the bigger lessons I have learned these past four years and I'm thankful for them. If you have some good marriage advice or have any more questions about what I wrote please feel free to comment below. Always having someone to laugh with, having someone with whom you have endless inside jokes...that's a pretty awesome part of being married! Happy 4 years, Becca!! Having mentors is such a blessing. We have individual Christian mentors who we meet with regularly as well as a couple from church who mentor us together as a couple (we try to meet with them at least once a month for dinner). There is just something so great about having someone who has been through more of life than you to speak truth into your life. Love it! These are cute pictures of the two of you :) Normally I would totally agree that your mom is not a qualified unbiased third party, but my mom actually does a good job seeing both sides and encouraging me in my marriage with Jordan. I think because Jordan and my dad are similar in a lot of ways, and my mom and I are so similar, so she has valuable experience for me. But having a good Christian mentor is a wonderful idea.